Have you heard? Newton Creek Manor is renting! The mobile home park has multiple spaces open and ready for rent. All we need is your RV or Mobile Home! Rent is $375 (includes water, sewer, and garbage) and requires $375 deposit at move-in. This community is located off of Stephens Street near the Roseburg downtown. With new road improvements and new water line installations completed, this is one community you don’t want to miss. We have a special deal running for a short time! Pay your first two months of rent and get your third month free! For questions, give Silvia a call at 541-671-5861 or email spavacich@ucpm.org. Equal Housing Opportunity, month-to-month rents, and income qualifications do apply. The last state of our mission: how are we doing? Meet our new HOC Director! Tell us how our outreach is going! Have you heard? We have new job opportunities to positively impact Southern Rural Oregon! Take a look at the following descriptions from our latest job opportunities handout. For more information or to sign up, email mmartin@nwumpqua.org. Make sure to share! Have you heard? We have new positions opening up! If any of the following jobs seem interesting to you, make sure to send a letter of interest and your resume to Michelle Martin at mmartin@nwumpqua.org or fill out the form below. The SummerCorps Client Coordinator oversees all aspects of the client experience of receiving services from Rebuilding Together. They strive to build trust within the community and awareness among targeted populations most in need of our services. 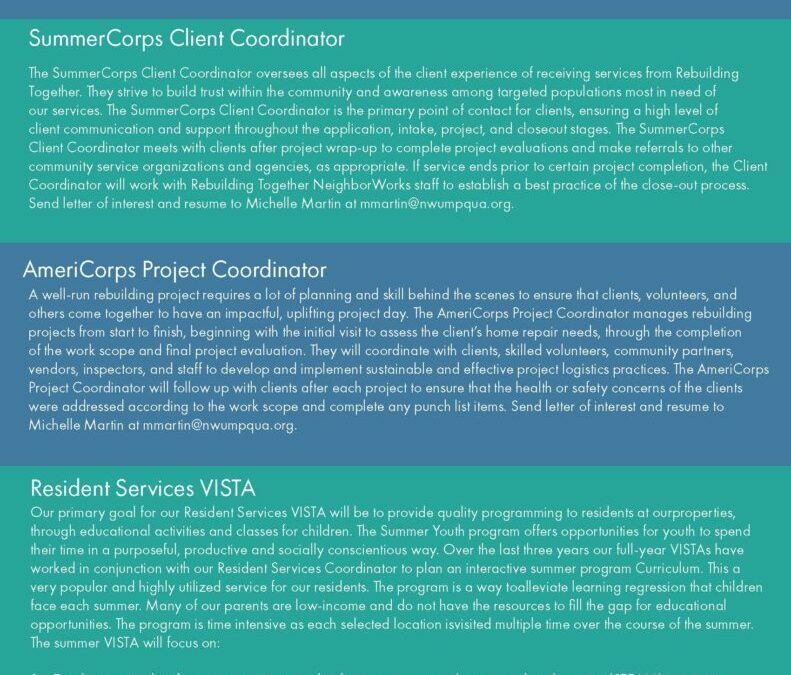 The SummerCorps Client Coordinator is the primary point of contact for clients, ensuring a high level of client communication and support throughout the application, intake, project, and closeout stages. The SummerCorps Client Coordinator meets with clients after project wrap-up to complete project evaluations and make referrals to other community service organizations and agencies, as appropriate. If service ends prior to certain project completion, the Client Coordinator will work with Rebuilding Together NeighborWorks staff to establish a best practice of the close-out process. Interested? Send letter of interest and resume to Michelle Martin at mmartin@nwumpqua.org or fill out the form below. A well-run rebuilding project requires a lot of planning and skill behind the scenes to ensure that clients, volunteers, and others come together to have an impactful, uplifting project day. The AmeriCorps Project Coordinator manages rebuilding projects from start to finish, beginning with the initial visit to assess the client’s home repair needs, through the completion of the work scope and final project evaluation. They will coordinate with clients, skilled volunteers, community partners, vendors, inspectors, and staff to develop and implement sustainable and effective project logistics practices. The AmeriCorps Project Coordinator will follow up with clients after each project to ensure that the health or safety concerns of the clients were addressed according to the work scope and complete any punch list items. Interested? Send letter of interest and resume to Michelle Martin at mmartin@nwumpqua.org or fill out the form below. Help children create a volunteerism project to improve their community. Interested? Send letter of interest and resume to Michelle Martin at mmartin@nwumpqua.org or fill out the form below. The primary goal for our Home Repair IT Specialist VISTA is to help the organization develop stronger IT systems for our Home Repair Program. We work with the local cap agencies and funders to access weatherization dollars. The VISTA may review the requirements for accessing weatherization funding in conjunction with funding from our organization so that the customer may approach funding from either organization. The VISTA may work with funders to help establish grant criteria upfront and determine data collection requirements. The VISTA will work closely with the Rehab Specialist, Customer Engagement Team, Program Manager and the Director. The VISTA will also work closely with our IT department to ensure that the programs work well with our current systems. The VISTA will need access to a computer, software programming, telephone, office space, desk and other office supplies as needed. If the VISTA needs specialized equipment, the equipment will be provided as long as the purchase is necessary to complete the job requirements. Interested? Send letter of interest and resume to Michelle Martin at mmartin@nwumpqua.org or fill out the form below. Our primary goal for our CIM Survey Summer VISTA Associates will be to coordinate the collection of CIM surveys in partnership with community volunteers during a six-week period in summer 2019. During this period 200 surveys will be collected using I-pad data entry in the defined neighborhood area. Data will be collected in the afternoons and early evenings. The CIM Survey Summer Associates will also work to prepare materials for our 2019 Community Leadership Institute program. Summer Associates will be expected to schedule meetings, print and organize CLI handbooks and other materials, set up electronic file-sharing systems, and generally, make sure that necessary systems are in place to begin the 2019 Fall CLI program. Interested? Send letter of interest and resume to Michelle Martin at mmartin@nwumpqua.org or fill out the form below. Must be a Word or PDF file.